Perhaps the sweetest "what I wanna be when I grow up" story of all time, somehow my son loved this one before I started digging out my old BIG Scarry books. 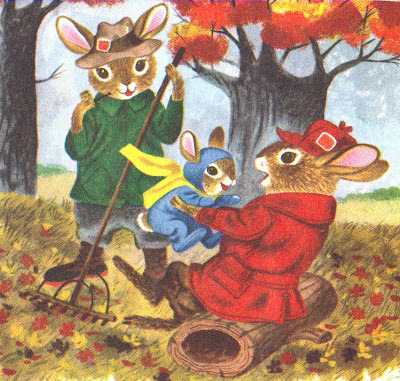 Though Richard's over-sized "Busytown" books didn't arrive until the 60s, he illustrated a good many Little Golden Books the decade before like this one, written in collaboration with his wife, Patricia. 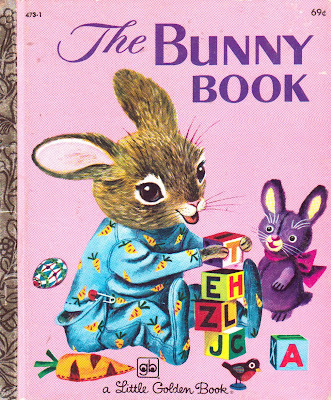 The story of the sweetest baby bunny... his future is what propels the action of the story, mainly in that everyone from his cousin to his grandma speculates what he might be when his legs grow out. THE daddy bunny tossed his baby in the air. "What will our baby be when he grows up?" asked the daddy bunny. 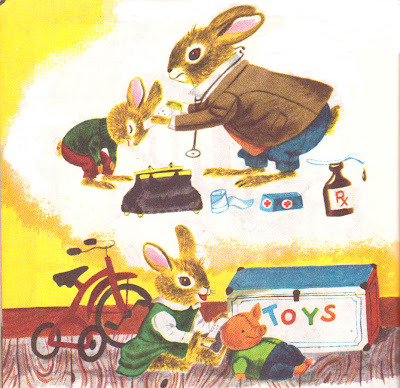 "He will be a policeman with gold buttons on his suit," said the mother bunny. "He will help little lost children find their mothers and daddies." "Maybe he will be a circus clown," said the daddy bunny. "He will wear a funny suit and do funny tricks to make the children laugh." "Why can't our baby be a cowboy?" asked the bunny brother. "If he grows up to be a cowboy he can ride horses at the rodeo." But the baby bunny did not want to be a policemen or a circus clown or a cowboy when he grew up. He sat in his basket and smiled at his bunny family. He knew what he would be. His prospects look pretty good to his family too... with aspirations from lifeguard to lion tamer to candy man. You know, with all the playground "bad boy" talk my son has picked up during his short stint at preschool, innocent stories like this are what keep me going and remind me that he's still a young'un when I'm holding him tight reading him a book. Nothing makes the heart light like a wee bunny in pajamas! I just love Richard Scary, and read his books to my daughter too. This one looks fantastic. Thanks for sharing. Your blog is very sweet and a great memorial to beautiful children's books. Thank you.